if I have two copies of it and not TV shows that Hitchcock has not directed. I have an Excel-file with more details about my wants that I can mail all those interested. There is only one film that I don´t have since I got hold of Downhill and Waltzes From Vienna. Looking for the colour-tinted version. Have got copy from showing on swedish TV3 (1991). Only has 31 stills from the excellent article by J. L. Kuhns as published in Hitchcock Annual 1998-99.
included in the book "Hitchcock: hans liv og film" by Christian Braad Thomsens. Looking for a print with music track. Looking for the german version entitled "Mary" also directed by Alfred Hitchcock. though it's only 53 minutes out of the 80 minutes it is supposed to be. Have got a copy of it. Looking for the computer colored version. Looking for the theatrical trailer, if it exists. Looking for the trailer with gun-shot in colour. Looking for the 16 min cut from first version. Looking for the trailer, in english and not french as the one I have. Looking for a wide-screen print (if there is one) ? Looking for a wide-screen print. I have found the Soundstage release of the Soundtrack (1997) at Footlight. Looking for the Special Edition Laser Disc that came out in May 1998. Looking for the german version that supposedly is 7 minutes longer and a wide-screen print. the unused score by Bernard Herrmann released by Varese (1998). Looking for a wide-screen print with good sound. Have Corpse-In-The-Thames trailer also in german version with interview. Wet Saturday (1956) and Arthur (1959). Looking for Hitchcock presentations for shows he didn’t direct as well. Have got all 268 AH Presents and all 93 of The AH Hour. From the remake series I have all 80. Dont have all the presentations complete though. 4    4/mar/56   BACK FOR CHRISTMAS      Looking for the laserdisc "The Best of Alfred Hitchcock Presents Volume One" (1986). Hitchcock's middle announcements of which I have 74, I'm missing 19. See list of episodes, I'm missing middle announcements for those marked C or PA. I have tape tangle on "Forecast: Low Clouds and Coastal Fog". Have 21 episodes of the series. Only one is directed by Hitchcock, the premiere episode Four O'Clock. But another 9 episodes of these were produced by Hitchcock. Looking for the rest of the series. Have got a copy, but are looking for the original tape from SF Rush Video. 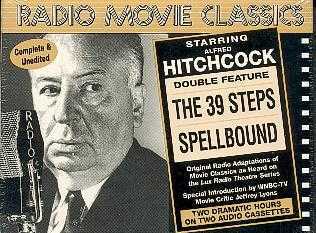 Looking for cassettes with radio broadcasts of Hitchcock's films, preferably directed by Hitchcock. 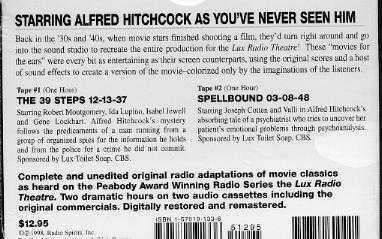 Spellbound starring Joseph Cotten and Valli from Lux Radio Theatre. that aired January 26, 1948 and starred Ingrid Bergman and Joseph Cotten. in two versions from "Once Upon a Midnight" on ABC and The Alfred Hitchcock Show. Psycho and The Birds. See Trailer section. Hitchcock, called "Alltid Denne Hitchcock", from Swedish Radio 1997 in three 45 minute parts. Looking for the original stories to films by Alfred Hitchcock. Don´t have the 1999 publication by the Hitchcock Annual Corporation.